This is an easy-to-read book with many real-life case-studies and examples which presents a yardstick for the enhancement of contemporary combat practices. In this context, the Namibian-Angolan-South African Border War serves as one of the principal benchmark studies. 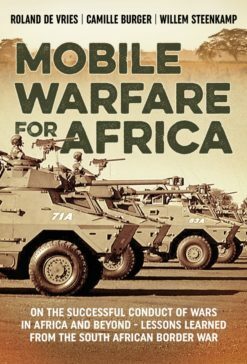 It was an armed struggle which typically evolved into a transnational conflict over time and which brought about all the imaginable political, diplomatic, military and social ramifications and complexities of African warfare. More so, this war included low as well as high intensity engagements across the full spectrum of warfare, playing out within a vast geographical expanse over an extended period – all elements holding valuable lessons to be learned from. It is also significant to realize that southern Africa served as a leading laboratory for counterinsurgency warfare at the time of the South African Border War, from which much can be learned by military practitioners, historians and scholars worldwide. 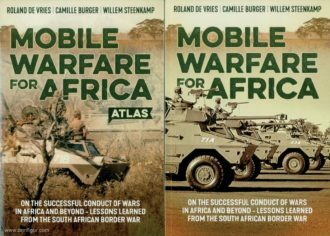 Major-General (Retired) Roland de Vries, a former Deputy Chief of the South African Army, is an internationally-respected speaker on what might be called ‘Third World War themes’. 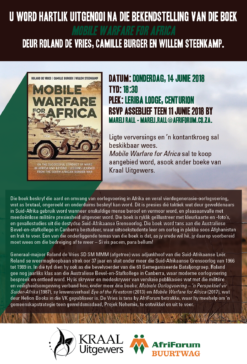 De Vries’ career bracketed the 23-year South African Border War, which was irrevocably interwoven with the machine he helped create – the incomparable six-wheeled Ratel Armoured Combat Vehicle – and his beloved regiment: the renowned 61 Mechanised Battalion Group. He participated in many military operations in Southern Africa during most of the 1980s and is deemed the ‘father’ of South Africa’s mobile bush warfare doctrine, which achieved such success during the fighting in Angola from the beginning of the decade to the end of hostilities in 1988. 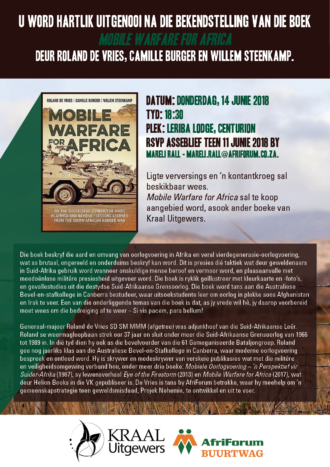 He has written two books which have become standard reference works: Mobile Warfare – a Perspective for Southern Africa (first published in 1987; then in revised and updated form in 2014) and his autobiography, entitled Eye of the Firestorm, which was published in 2013. Camille Burger served as an officer of the South African Armoured Corps for four years before commencing full-time studies to qualify as a town and regional planner. His deep personal interest in geography and cartography, however, gradually shifted his career focus towards geographical information systems and the related disciplines of aerial photographic and satellite image interpretation, as well as cartography. 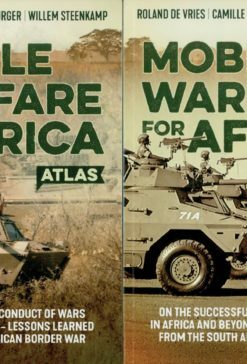 His keen interest in warfare in Africa – combined with his service background and his broader interests – has led him to become the most prominent specialised military cartographer in South Africa, with more than 120 insightful and highly detailed maps published in eight books (the most recent being Helion & Company’s Mobility Conquers). 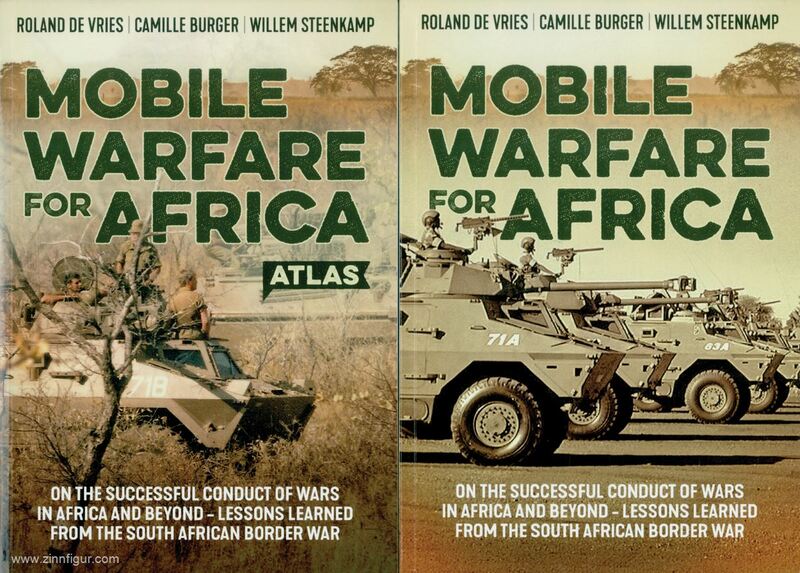 During his long career, Major Willem Steenkamp has been a Citizen Force soldier, security advisor, author, specialist tour guide, book editor and journalist, among other things. He has authored 20 published books – including various works on South Africa’s participation in the Second World War and the SWA/Namibian Border War. He has won four literary awards – one for journalism, two for novels and a fourth for professional military writing – and, as a young staff correspondent for United Press International (UPI) in the 1960s, he was twice cited in the UPI’s annual selections of ‘Best Articles of the Year’. A mechanised infantryman, Steenkamp was called up numerous times during the Border War. He denies that he is a military historian – describing himself as a storyteller and reporter whose journalistic mentors taught him his fundamental approach: ‘Follow the facts and tell the truth’.